One day I’m going to mail off my last postcard, although at the moment I still regularly send off a couple of cards from my travels. One to my about-to-hit-93-years-of-age mother and one to Maureen’s even older aunt. 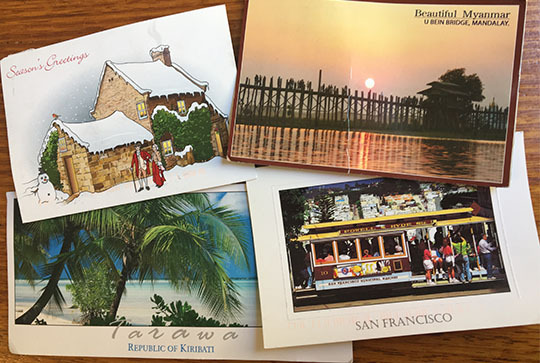 I’ve blogged in 2014 and again in 2016 about the difficulties of finding cards, the even greater difficulty of finding stamps for them and sometimes the greatest difficulty of all, finding a mailbox to send them from. It’s no wonder emails, Facebook, Instagram, all that instant contact is so popular. Because postcards certainly aren’t instant. I send these four cards off to my mother in the last six week. Clockwise from the top right corner I sent a postcard of U Bein’s Bridge in Mandalay while I was in Myanmar. The card took 35 days to get to my mother in Australia. A week later I sent a couple of cards from San Francisco. The little cablecar (riding half way to the stars) took 15 days to ride across the Pacific to Australia. Card 3 from Kiribati in mid-Pacific took 18 days to make its way across half the Pacific. That’s not bad when you consider there are only two flights a week from Kiribati to Fiji, which I assume was the first stop en route. Finally I sent the postcard of Captain Cook’s cottage in an unlikely snowstorm (since the cottage is now in Melbourne, Australia where it never snows). Now from the cottage location in Melbourne’s Fitzroy Gardens it’s 9.8km to my mother’s place. Google Maps says that’s less than half an hour by car or one hour 46 minutes if you decided to walk. So why did Australia Post take nine days to deliver that card? What on earth were they doing with it all that time? Still I’m going to miss lots of fun when I stop sending postcards. In Yangon in Myanmar I ended up in the touristy Scott Market searching for a post office to buy stamps. I finally tracked it down up two flights of steps. Then there was a long search for appropriate stamps (2000K to Australia and it has to be as a 1000K and two 500K stamps, clearly she didn’t have any 2000K stamps or two 1000K ones). Then there was careful planning to get the large stamps on the small card and still leave room for the address and a few lines of greeting. Next there was the glue pot so the stamps will stick on and finally handing it over for safe conveyance. When I got back to the hotel I realised I’d forgotten to get a card for Aunt Kate and the hotel gift shop not only had cards cheaper (350K rather than 500K), but also stamps and insisted the postage was only 1000K not 2000K. Later I went by the main Strand Rd Post Office and double-checked, the postage was indeed just 1000K. It’s absurd, I don’t think the first post office cheated me, they just didn’t know! When I bought postcards and stamps at the post office in Bairiki, South Tarawa in Kiribati I found a little gathering of young Taiwanese guys, all sending postcards home. They’re not dying out just yet.